Tracing a three-legged dog and biped director on a journey through the Czech present and Czechoslovak past: the four-year-old Edward Beneš saves the lives of his parents, the sixty-year-old Václav Klaus plays and doesn’t play tennis, a statue bangs its head against a wall. People fight in ketchup and bury their dogs. A collapsed house, house made of marihuana and a millionaire’s villa. Polar bears, ants, falcons, foxes. Songs of Milan Záviš Smrčka. The world according to Karel Vachek. 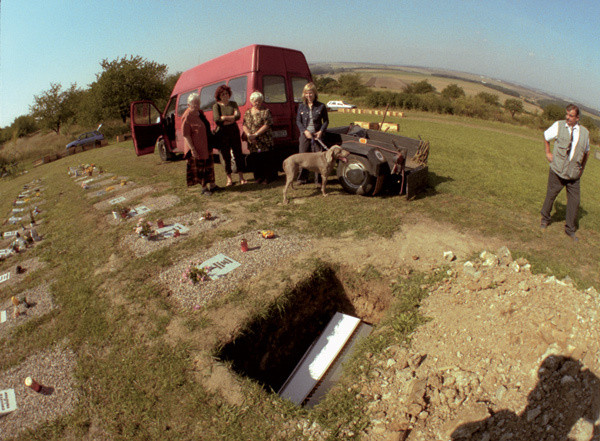 A dog’s funeral becomes part of a chain of absurd events including a tomato ketchup battle, a reconstruction of the battle of Austerlitz and a motorbike show. Its common denominator is the commercial interest of sponsors and big business, the ambivalent winners of privatization and participants of numerous corruption affairs. Vachek debates corruption and environmental disaster, but insists that there is an alternative. Against the mass of pseudoevents is the independent techno-party CzechTekk, raided by the police despite the fact that it was entirely law-abiding, whose participants Vachek believes to be the new unionists.